For Labor Day weekend a few years back, I got together with a bunch of friends from college to go camping in Yosemite. We did the hike to the top of Half Dome. The hike is 17 miles round trip, and though it’s long, it’s not too difficult with one glaring exception: the last 400 yards. The very end of the trail is a nearly vertical climb up a granite wall. There are two steel cables climbers hold with their hands, and a series of wooden planks for steadying their feet. There is no guide or park ranger at the bottom. When we did it, there was nothing at the bottom except a box of loaner gloves to help climbers to better grip the steel cables. It was raw and rugged, and that’s kind of how I felt about the Papaseea Sliding Rocks. Since a lot of Peace Corps are still on school break, and since today as an aso malolo, a national day of rest after yesterday’s holiday, there were a lot of PCVs in Apia today looking for something to do. So a bunch of us (and one JICA volunteer) headed across town to play on the Sliding Rocks. The sliding rocks are a series of natural waterfalls that have become so smoothed by moss and erosion, they’re like natures answer to a water park. 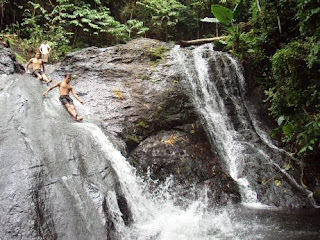 Similar to the Paulauli waterfall my parents and I visited on Savaii, the Sliding Rocks are a tourist attraction owned by the local village. They charge a nominal entrance fee, and you can hang out as long as you want. Alcohol is never allowed, and with good reason. The Sliding Rocks are pretty intuitive, but it’s easy to see how they could quickly become dangerous. And for that reason, it’s difficult to imagine the Sliding Rocks existing in The States. In America, someone would do something stupid and then sue the village, and that would be the end of it. There would be guard rails, lifeguards, rubber padding, rules posted everywhere, etc. But like I said, as long as you “use as directed,” you’re good to go. Sliding down rock faces is not unlike bungee jumping (or climbing Half Dome) in that your brain perceives fear and then you must consciously override the fear to do it. The situation set off red flags and half my brain had to assuage the fears of the other half of my brain. This entire process only takes a second or two, but the moment was evident in everyone that went down the slides today. Even on the faces of the boys from the local village who were hanging out at the slides, there was evidence of coaching a subconscious. Granted the boys were doing stunts that the rest of us wouldn’t dare try. 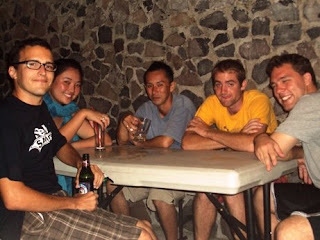 They were delighted to learn that we were Peace Corps, and after a long back-and-forth with Max, one felt he needed to impress us. 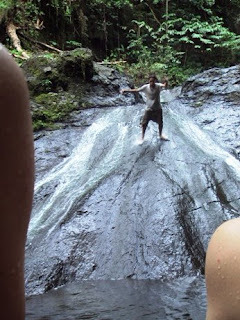 So he walked back to the top of the waterfall and then shot Max a gesture that said, “Watch this. This one’s for you.” We all watched intently. The kid did a somersault over the top of the falls and lands on his feet on the decline, and slides down the rock face in the standing position. 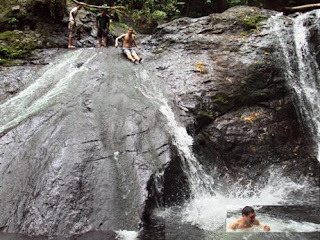 As he disappeared into the pool at the bottom of the falls, we hooted and hollered and applauded. As much as we were grateful for the show, we were also relieved that none of us had to fish the kid out and maintain inline stabilization until the paramedics showed up. In the end, we all came out unscathed, and we agreed it was worth $2 and a taxi ride. Hope your day was fun. Pictures below. 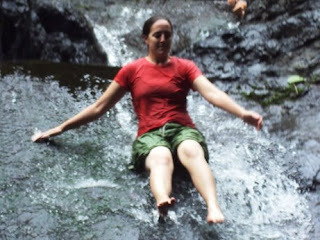 Composite photo of me sliding down the waterfall (starting, sliding, splashing). Composite photo of Max (starting at the top, splashing, and then recovering from the splash). Phil starting, sliding, splashing, recovering. Local village kid going down waterfall standing up. At the bar last night. 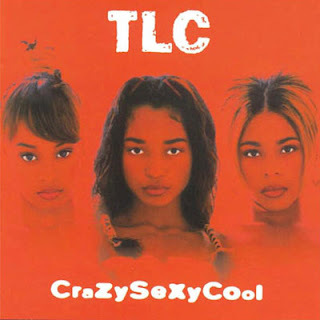 Left to right: Me, Rosie, Tetsuya, Trent, Christian. The weird thing about this moment is there was one of us from each Peace Corps group currently present in Samoa plus a JICA volunteer. Respectively: Group 81, Group 79, JICA, Group 80, Group 78. 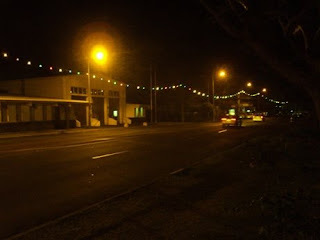 When the shuttle rolled back in to Apia last night, strung lights were blinking to commemorate Independence Day. These lights have been strung since the 2007 South Pacific Games were held in Samoa, but I've never seen them lit. I was excited to see them lit; excited enough I felt compelled to tap the shoulder of the tourist sitting next to me explain how uncharacteristically festive Apia looked. Everyone I've talked to has agreed The Powers That Be should turn them on more often. I only had the guts to slide down the lower larger rock slide once...wouldn't even have attempted the bigger one that you see as you come down the stairs. Sara wouldn't even let me climb down with my camera to take pictures of her and Cale coming down the lower slide...she feared her decrepit mother would kill herself...such a reversal of roles!! Glad you had fun too! That looks sooooo fun. 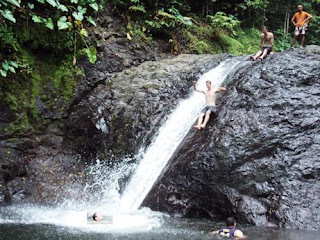 I definitely want to go there next time I'm in Samoa.